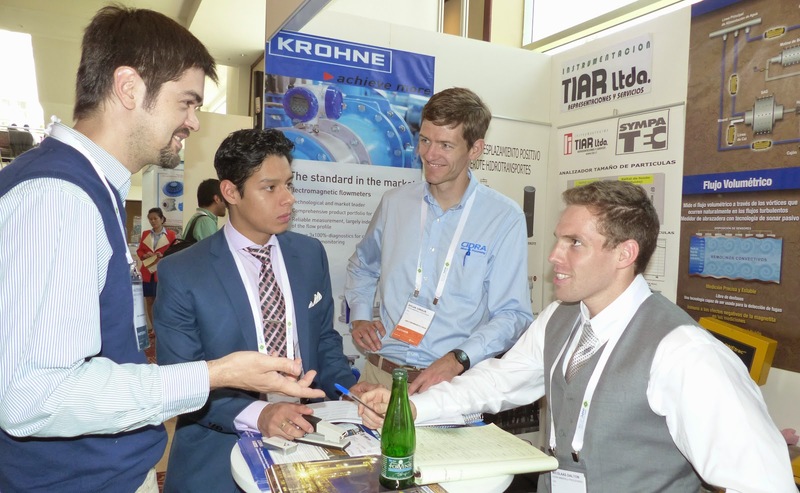 This year's International Mineral Processing Congress was held for the first time in Chile, at the Sheraton Hotel and Conference Centre in Santiago, from October 20th-24th. 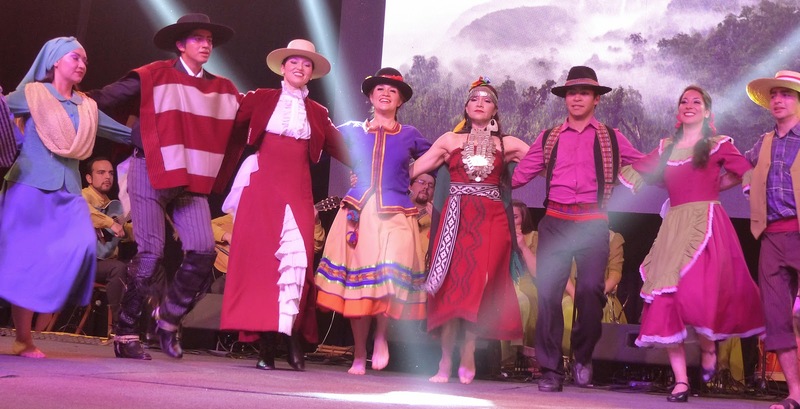 Local organisers were Gecamin, Universidad de Chile, Universidad de Concepcion, Colegio de Ingenieros de Chile, and Universidad Tecnica Federico Santa Maria, under the chairmanship of Prof. Juan Yianatos of the latter University. This was my 11th IMPC, my debut being in Stockholm in 1988, the only one I missed since then being Rome in 2000, where Amanda represented MEI. 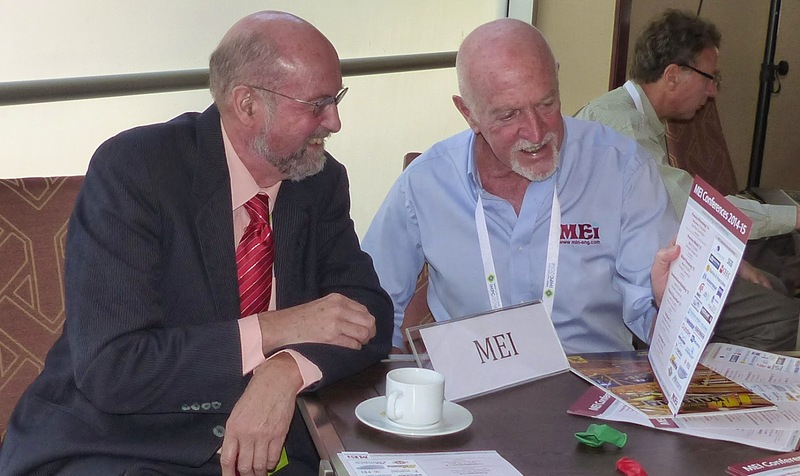 MEI has been a media partner to all Congresses since 2003. 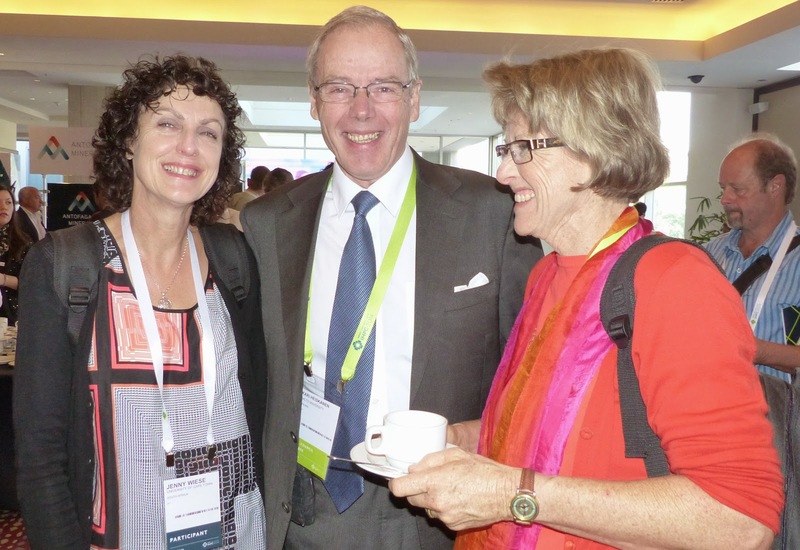 The Cape Town conference in my opinion ushered in the 'modern era' of IMPCs. Prior to 2003 they had been rather stiff, formal affairs, but Cape Town showed that conferences could also be fun and that networking with people was just as, if not more, important than formal presentations. Congresses since then have been memorable events- who could forget the spectacular gala dinner in Beijing in 2008 (see posting of 20 March 2010). So I look forward to the week with great anticipation and, as always with my conference diaries, these are my personal experiences of the event. As around 500 papers from 50 counties are to be presented it is obviously impossible to report on the technical programme, although I will dip into a few presentations when time allows. Hopefully my report will capture the atmosphere of the IMPC and its people, rather than the technical content, and I very much welcome comments from others. Last night's welcoming cocktail reception (see posting of 20th October) preceded this morning's opening ceremony. 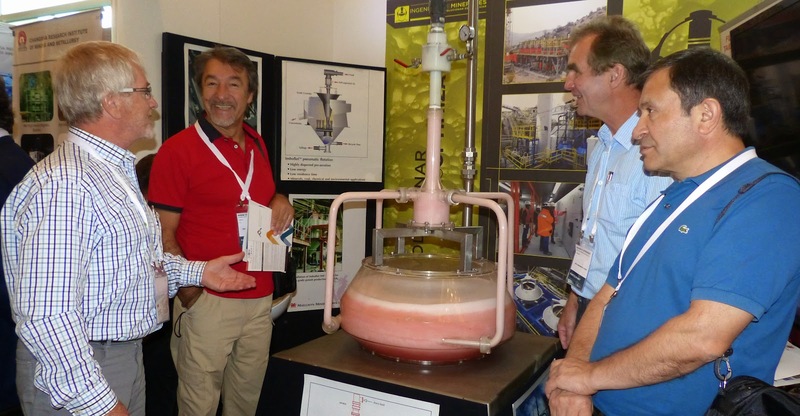 Around 1100 delegates are present, making this Gecamin's biggest ever undertaking. 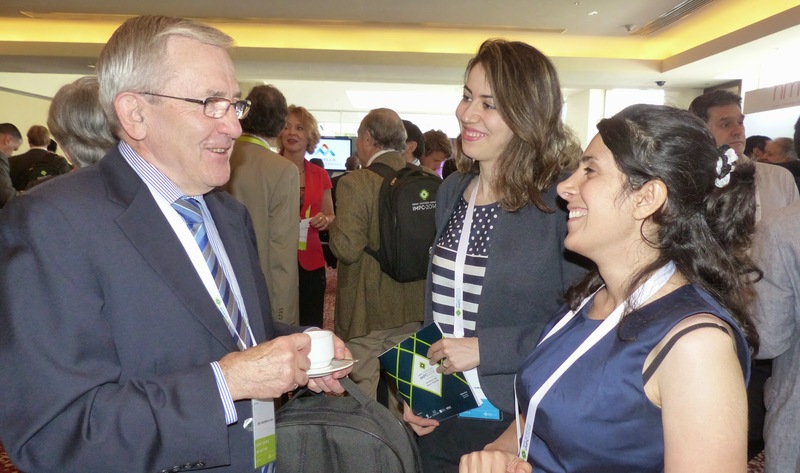 One of the congress's major sponsors is Outotec and appropriately, as the company is noted for its green policies (posting of 12th February 2014), Jaako Leppinen of Outotec presented the first of the plenaries, reviewing how sustainability challenges of future concentrators might be overcome. There is a demand for more energy efficient technologies, particularly in comminution, and there is also an increasing awareness that more intelligent water management is required for reduction of fresh water consumption and for mastering the impacts of process water recycling on performance. This was a good introduction to one of the two other plenaries this morning, which dealt with sustainable mining at Antofagasta Minerals in Chile. The sessions then split into parallel sessions, with the usual unavoidable clashes, such as Flotation Fundamentals running alongside Non-Sulfide Flotation. I did not get to any of the papers in these sessions, so would be interested in comments and highlights from those who attended, and this will apply to the sessions of each day. 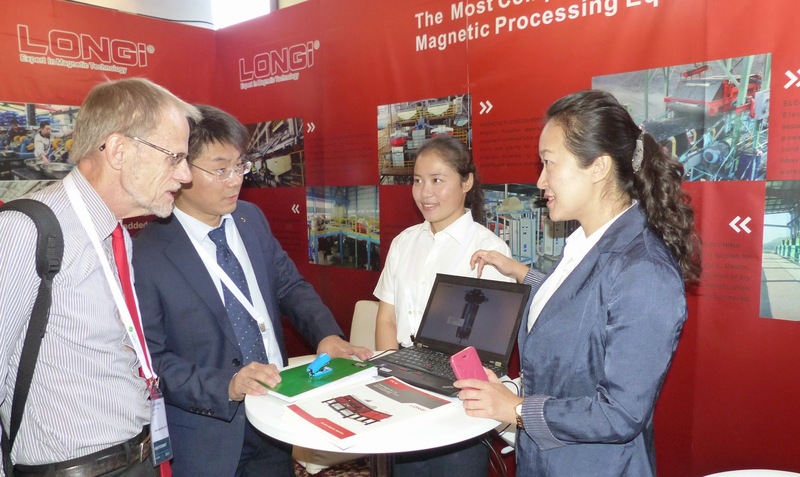 The exhibition is much smaller than at recent IMPCs due to space limitations at the hotel, and only corporate sponsors have booths, spread over two floors. During the coffee break in the exhibition area I caught up with a few old friends, including Jennie Wiese, Kari Heiskanen and Dee Bradshaw. Jennie and Dee I have known since they were post-grad students at the University of Cape Town. Jennie is still at UCT, involved with flotation research, and Dee is now a Professor at the JKMRC in Australia, having just completed a sabbatical at Hacettepe University in Turkey. Kari will become Emeritus Professor on his retirement from Aalto University, Finland, next month. He will then divide his time between mentoring young people and assessing innovations with Outotec, and undertaking teaching and research at the University of Cape Town. I spent some time this morning with Prof. Jim Finch of McGill University, Canada, who will be chair of the next IMPC in Quebec City in 2016. Jim and I discussed a project that we have been working on for the past 2 years. 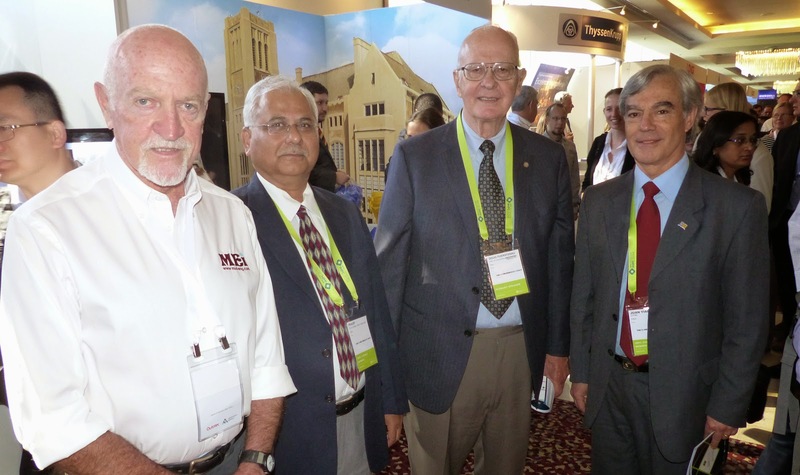 He and his team from McGill, and others, have been producing a major update of Mineral Process Technology. This 8th edition will be published in late 2015 and launched at Flotation '15 next November. After a good buffet lunch in the poolside restaurant there were 6 more parallel sessions. 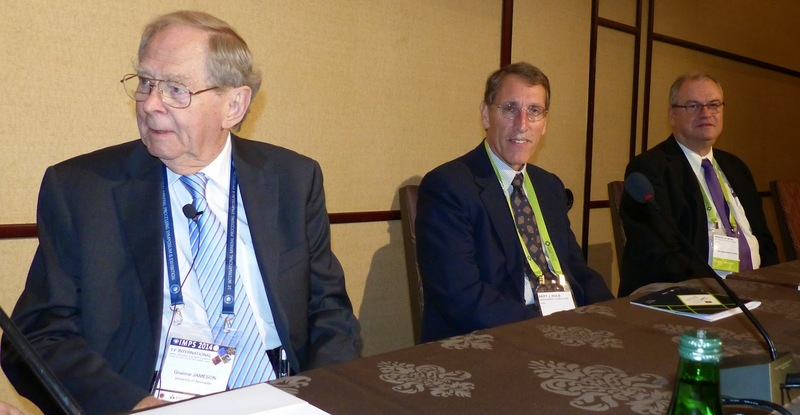 One of these was a special session on the future of mass mining and concentrators. As Alban Lynch had recommended that I attend the presentation by Gideon Chitombo of the University of Queensland, I did just that. Gideon discussed how mass mining methods, particularly block caving, as well as open pit methods, must evolve as mines go deeper and this will affect processing, but unfortunately he did not get as far as elaborating on this! This was followed by a paper by MEI Young Persons Award winner Peter Amelunxen, of AminPro, Peru, who asked whether bigger processing equipment is better, the overall conclusion being not always! 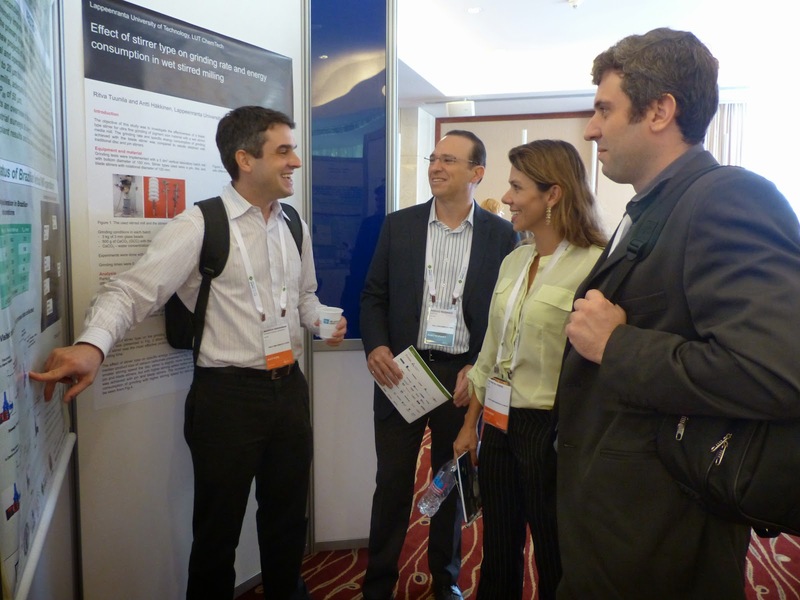 After a long day, the sessions finished with a well attended poster session. 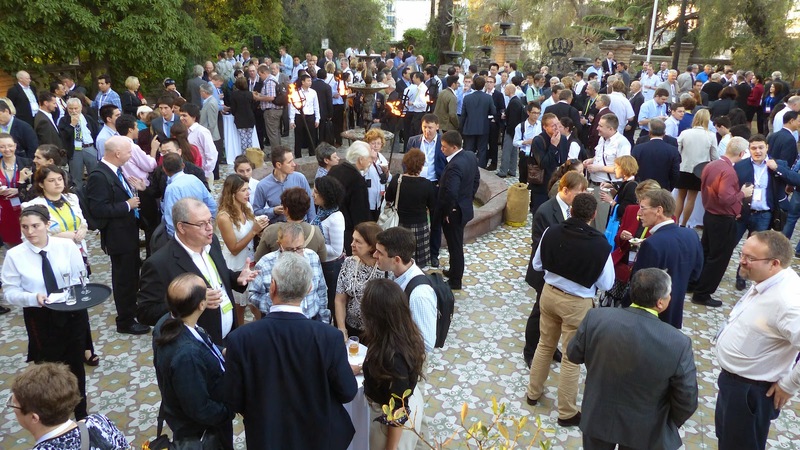 This was followed by the Official Welcome Cocktail, which gave delegates and their partners a relaxing hour of socialising (posting of 20th October). A major thrust of flotation research in the not too distant past was the flotation of ultrafine particles, but with the current awareness of the need to reduce energy consumption in concentrators, there has been a noticeable switch in emphasis towards floating particles in as coarse a state as possible. Coarse flotation is often inhibited by the inability of flotation machines to deal with particles as large as 300 microns, but fluidised bed flotation technology can give high recoveries at coarse particle sizes, as shown by Graeme Jameson, of University of Newcastle, Australia in this morning's first plenary lecture. Calculations show that reductions in the running costs of a mine and associated concentrator of the order of 10-20% could be achieved, the major effect being the reduction of mass flow to ball milling. 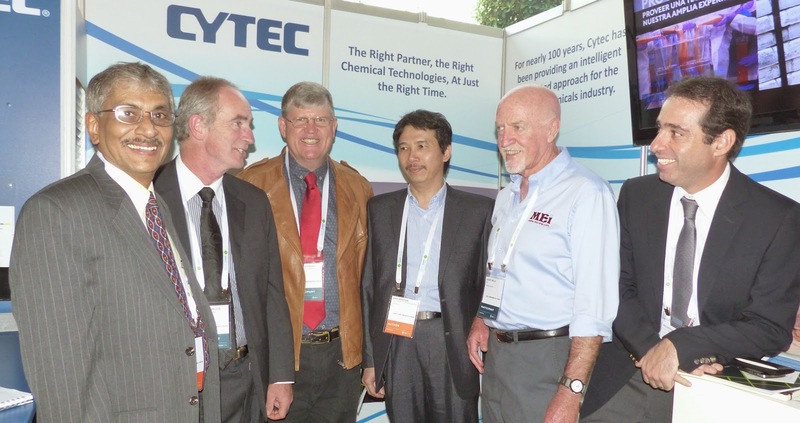 IMPC sponsor Cytec, a leading manufacturer of reagents, is also developing innovative technologies for floating coarser particles with formulated collectors, and encouraging results have been achieved with their AEROFLOAT MX-500 product series. Cytec has also made significant advances in partially replacing the NaHS used in Cu-Mo separation with the user friendly polymeric product AERO 7260. In the second plenary lecture, Bert Huls of Goldcorp, USA discussed the drivers that will change the design and operation of future processing plants. These drivers include water and energy conservation requirements, a larger demand for metals as a result of a rising population, and the increasing demand from the population in general to have influence over what type of operations will be developed where. These social issues are increasingly recognised as significant inhibitors to mineral development projects, as discussed by Marcello Veiga of the University of British Columbia, Canada in the 3rd plenary lecture. 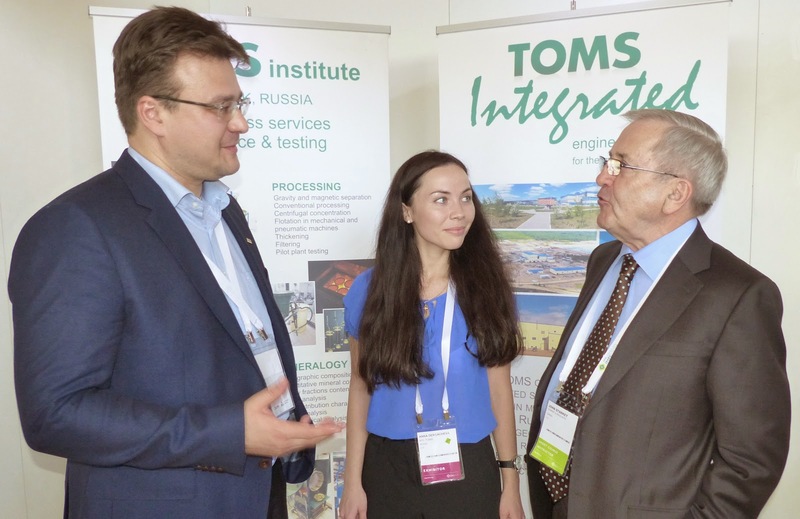 Comminution '16 sponsors Arkedy Senchenko and Anna Dergacheva, of TOMS. 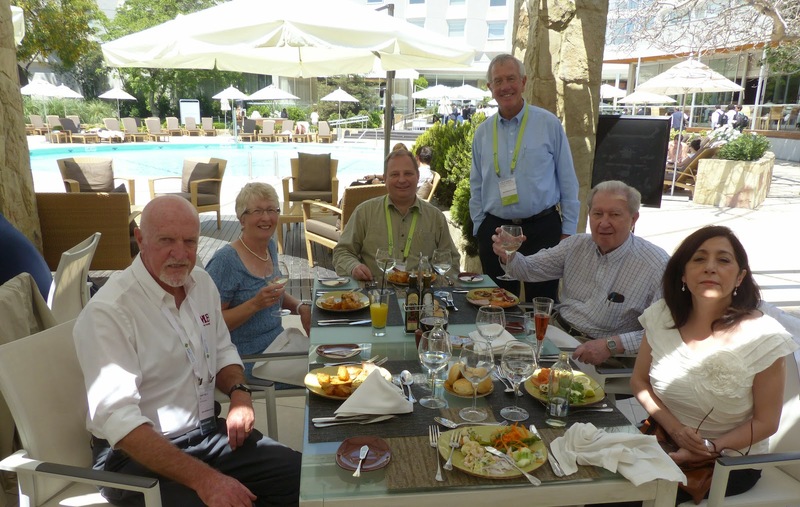 Barbara and I had an excellent lunch by the hotel pool with IMPC Chairman Cyril O'Connor, IMPC Proceedings Executive Editor Alex Doll, and guests Roger and Elizabeth Kelley. I worked with Roger in Zambia a lifetime ago, so it was good to reminisce. Biohydrometallurgy has never been a major feature of IMPCs but an afternoon keynote by Tomas Vargas of Universidad de Chile asked whether bioleaching of sulphide ores will ever replace the traditional flotation-smelting route. Heap bioleaching has enabled the treatment of secondary copper sulphide ores and low grade ores, but extension of this to primary copper ores has been limited until now by the nature of chalcopyrite, which is very refractory to leaching. However important improvements are expected by using improved designs that enable operation at high temperature ranges where copper is leached faster under the catalytic action of thermophile organisms (see also Biohydromet '14). A long day finished with the IMPC Open Forum, where it was announced that the IMPC in 2018 will be held in Moscow. Bids have been invited for 2020 from Poland, South Africa and USA. The final decision will be announced at the next IMPC in Quebec City in 2016. Details of all IMPC matters can now be found on the new website. Then a complete change of scene, a transfer by coach to nearby Santa Lucia Hill for cocktails at Castle Hidalgo followed by an evening of culture (posting of 22nd October). The day started with 3 plenary lectures from eminent speakers. In an effort to offset the many challenges facing the mining industry, leaders are now starting to adopt comprehensive information strategies to improve operational efficiency and business performance. Osvaldo Bascur of OSIsoft, USA, gave examples of how mineral processors have adopted new strategies such as self-serve business intelligence, data mining, cloud computing and internal/external collaboration. Doug Fuerstenau of University of California discussed how comminution research can assess energy efficiency, grindability and HPGR technology, which was followed by a completely different approach to research, given by Jannie van Deventer of the University of Melbourne. I admire people who ask provocative questions and are prepared to think out of the box. Jannie is such a person, and I recently published a very controversial paper of his in Minerals Engineering, which was vigorously debated on the blog (posting of 12th August 2013). He alluded to this and his 'invisible gold' ideas today in his plenary lecture, as well as emphasising the need to think laterally in order to drive innovation in mineral processing. 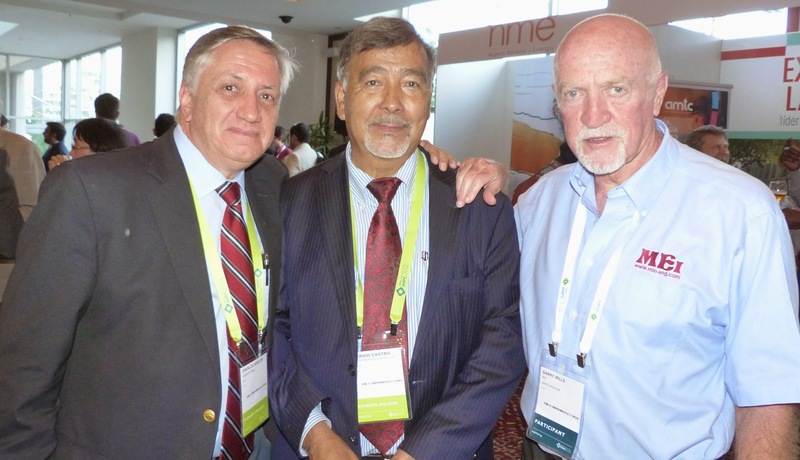 Mines of the future will need such innovation and vision, as was discussed by Robin Batterham in his paper on progress towards the sustainable mine of the future, an update on the presentation that he gave at the 2003 IMPC in Cape Town. I am not sure how many delegates from China are at the Congress, but it is a lot, as can be seen from the photo that I took of all the delegates from that country. Compare this with the four delegates representing the UK and the conclusions speak for themselves. As highlighted by Han Long of BGRIMM, Chinese research capabilities and resources have grown rapidly with the Chinese economy in the past three decades. 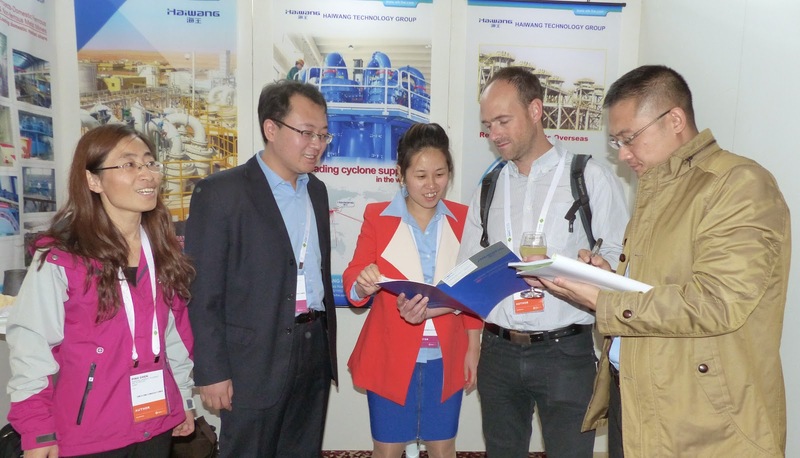 There are now 33 Universities and colleges teaching mineral processing, and more than 20 research institutes dedicated to mineral processing, with the largest number of students, teachers and researchers in the world, so there are great opportunities for international collaboration. 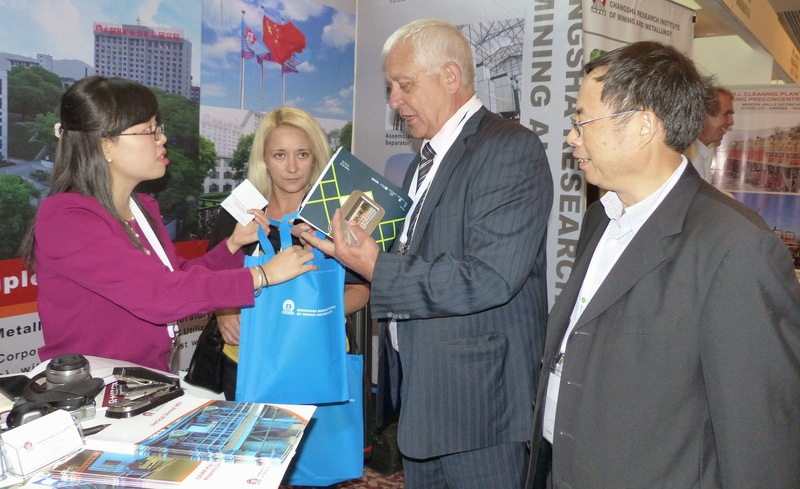 It is also good to see so many Chinese companies exhibiting, a trend that we are now seeing at many conferences. In contrast to China, most of the minerals engineering programmes in western universities have died or are dying, while the technical challenges of designing and operating effective process plants are increasing, such that the ability to run efficient mineral processing operations has been severely compromised. Diana Drinkwater of JKTech, Australia, proposed that well designed professional development can help to recover this situation easily and cheaply. The workplace is the best environment for such skills development. Professional development training should be integrated with normal duties throughout the early years of a graduate's service (and probably beyond) and the cost should be regarded as non-discretionary expenditure for the business. After a very long day, we were off to Casa Piedra for the Gala Dinner, particularly memorable for me and Roe-Hoan Yoon, recipients of the IMPC Distinguished Service and Lifetime Achievement Awards respectively, and the young researchers awarded for their presentations, but also for the wonderful Chilean entertainment provided (posting of 23rd October). Probably due to last night's Chilean wine, I arrived a little later than usual for today's programme. The highlight this morning was the Lifetime Achievement Award lecture from Prof. Yoon. Entitled "From basic science to flotation design" I'm afraid the maths was beyond me, so I will leave it to others to comment on the presentation. 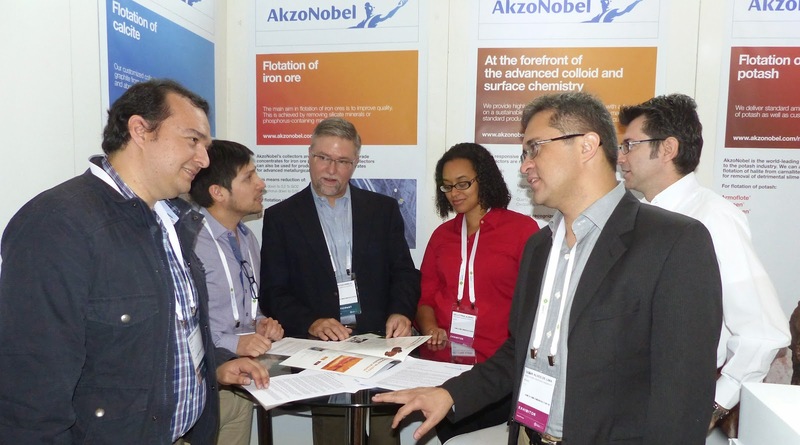 Odair Lima of AkzoNobel Surface Chemistry, presented a paper this morning proving a new anionic collector for phosphate ore meets all the requirements for flotation efficiency and sustainability. 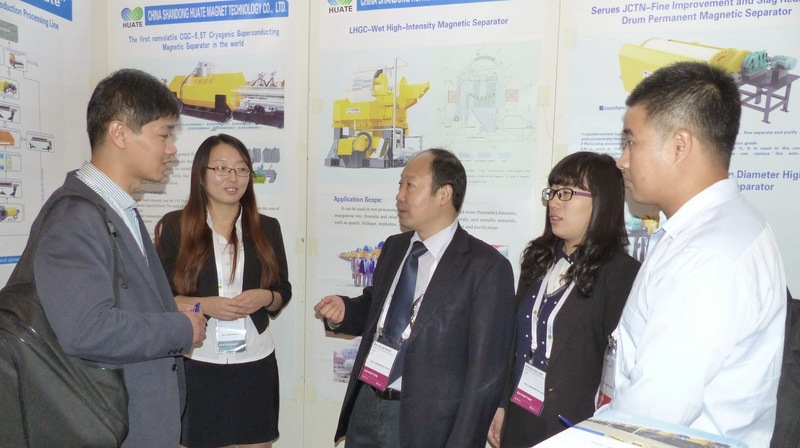 At its booth, AkzoNobel displayed its extensive range of optimized flotation collectors and technologies. Odair said that when developing new surfactants for the mining industry, sustainability encompasses not only the environmental profile of the surfactants, but the use of renewable, easily available raw materials; minimal energy consumption and waste, and highly efficient performance. In closing the conference, IMPC chairman Prof. Cyril O'Connor remarked that the Congress had lived up to all expectations and thanked, on behalf of all delegates, chairman Prof. Juan Yianatos and his excellent team, particularly conference manager Romke Kuyvenhoven and the very professional Gecamin organisation. 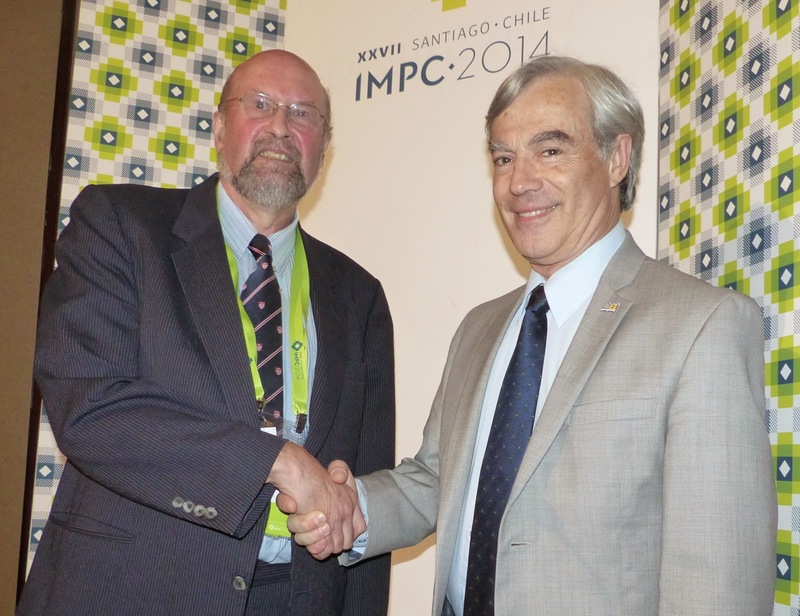 Before inviting delegates to a farewell party by the pool (posting of 23rd October) Prof. Yianatos handed over the chairmanship baton to Prof. Jim Finch, chairman of the next IMPC in Quebec City in 2016. The abstracts of the papers presented are available from Gecamin in 2 volumes ISBN 978-956-9393-15-0) which include a password protected link to the full papers. In 6 months time all papers will be available on SME's OneMine. For obvious reasons this will always be a memorable IMPC for me, but I would also like to thank the organisers for providing a great forum for networking. I now invite feedback and comments. I thought that the quality of the presentations was in general very good. Being my first IMPC, I approached it thinking that the flavour would be very similar to Procemin, however I was pleased that there was a much wider range of topics, many presentations on practical studies (which I feel is sometimes lacking from Procemin) and some interesting plenary sessions which made the morning commute in Santiago's peak hour traffic worth the effort. 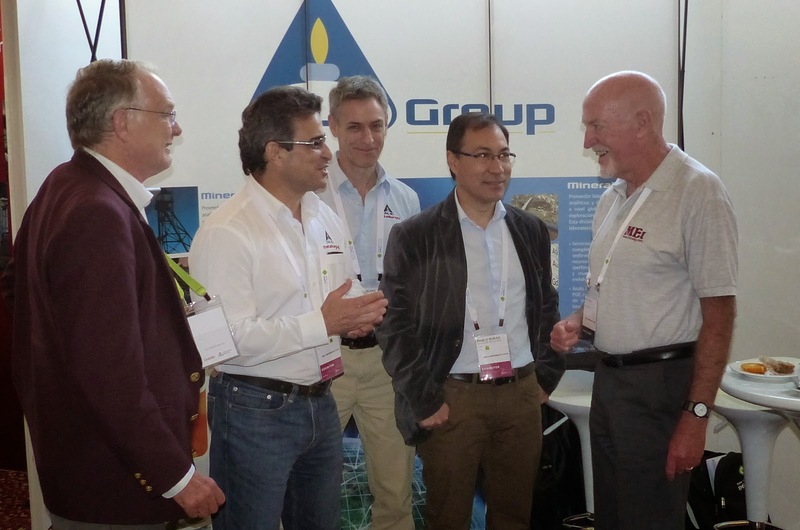 All up was very enjoyable and certainly well attended event (as was proved by the congested coffee breaks). 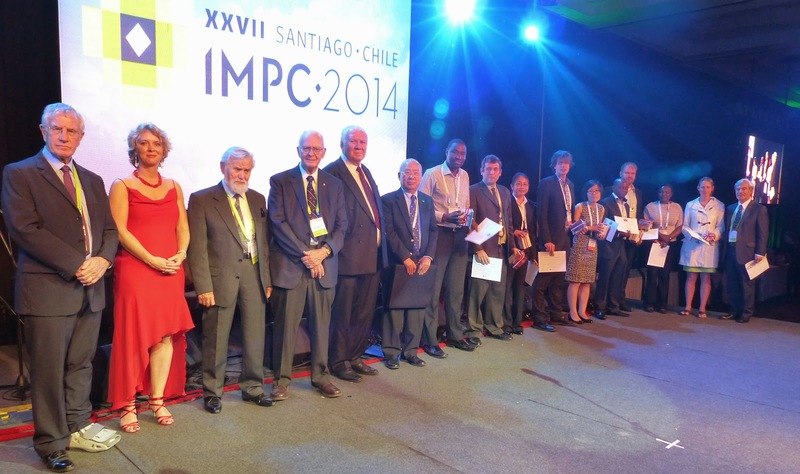 Congratulations for the Distinguished Service Award by IMPC 2014. Sir you deserve this award. 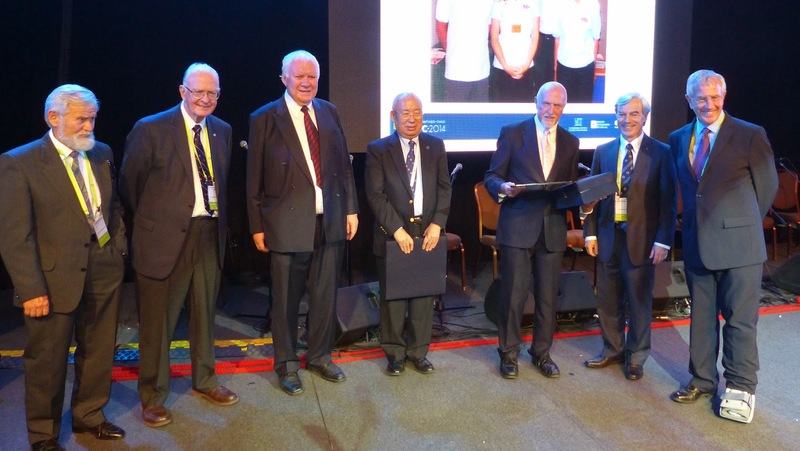 I congratulate Prof B A Wills and Prof Roe-Hoan Yoon, recipients of the IMPC Distinguished Service and Lifetime Achievement Awards respectively, and the young researchers awarded for their presentations during IMPC 2014. The IMPC is to be complimented for honoring the scholars.